Last edited by Soapboxmom; 09-05-2018 at 08:32 AM. Reason: Photo of Scammer Advertising her crap removed as fraudulent DMCA fight gets nasty! Report her to Facebook for having multiple accounts. The more who do the better the chances they will suspend her account or at the minimum make her take down 2 of them. Get as many people as possible to do the same. Let's turn up the heat on her since she is such a stickler for following the rules. 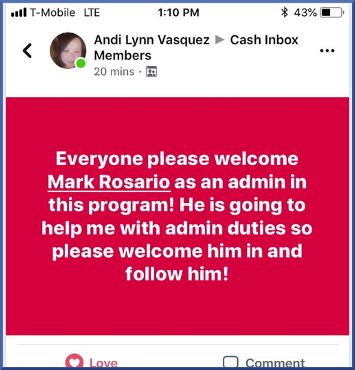 In looking at this Facebook page: https://www.facebook.com/marybethang the program she's currently promoting is called Cash In The Box. There's a short video there that tells more about the program. My knowledge of these types of programs is limited, but the video mentions no products at all. Just sounds like a cash gifting type of thing. Maybe someone else here on RS has some more insight? So let's see, the domain registration is set to private, no information on the website who is running the program, and your only means of contacting them is by email. What possibly could go wrong? This is what we call a two-fer. It is one part illegal cash gifting, and the other part promoting whatever lame program you are a member of that gives you a referral fee for signing people up. Report Marybeth to the US Postal Inspectors office in her city. Just sounds like a cash gifting type of thing. It sounds "LIKE" a cash gifting program because it "IS" a cash gifting - pyramid - endless chain recruitment scheme. Ms Angiolelli can file as many bogus DMCA takedown notices as she likes, it makes no difference, she is STILL promoting schemes which are illegal in every state of the USA and we will continue to report on her doing so until she either sues or is prosecuted. Personally, I'd prefer it if she did sue. Watching either her or her attorney attempt to explain in a courtroom why what she's pimping is "legal" would be worth five times the cost of the airfare. And, soon it could be her partner in crime, otherwise known as her wannabee lawyer law student son, trying to defend her scammin' a$$. Andrea Lynn Vasquez of Hamilton, Ohio. She is herself entangled with Andre Wilson (I believe we already know this fake "Reverend" quite well from his serial scamming), and cybercrime support specialists Lukas Sasso and Derek Preston. Mark Rosario of Philadelphia, PA and Houston, TX. Since this lady Andrea Vasquez is apparently the actual owner of this program maybe she should have her own thread on here? Mary Beth Angiolelli is also promoting another program called American Bill Money. Again, I don't know anything about it, but it seems like the same sorta thing as Cash in the Box. So her son is a law student? I wonder if he knows what his mom does for a living? There are reasons why, when I expose gifting scammers, that I list their ABM (American Bill Money) ID as "hitman" or "hitwoman."